When your opponent activates a monster effect while you control this Special Summoned monster (Quick Effect): You can Tribute this card; negate the activation, and if you do, destroy it. 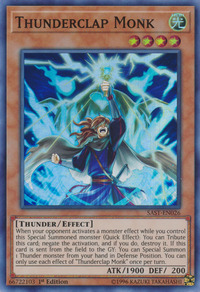 If this card is sent from the field to the GY: You can Special Summon 1 Thunder monster from your hand in Defense Position. You can only use each effect of "Thunderclap Monk" once per turn. This monster's original name alludes to Lord Rayleigh (John William Strutt), a physicist who discovered argon and identified the phenomenon of Rayleigh scattering.